According to The Hollywood Reporter, another werewolf film is headed into production – this one based on the excellent Boom! Studios comic Curse. Its four creators have made something like a tender paternal heart, then wrapped it in chains and stuffed it with wiry grey fur, blood-stained snow and the specific sadness that comes when you were real good at football but then someone stepped on your leg. Michael Moreci and Tim Daniel are bad men for thinking up a story where the character with the sunniest outlook is a kid with terminal cancer, and Riley Rossmo and Colin Lorimer are suspiciously adept at drawing human entrails. 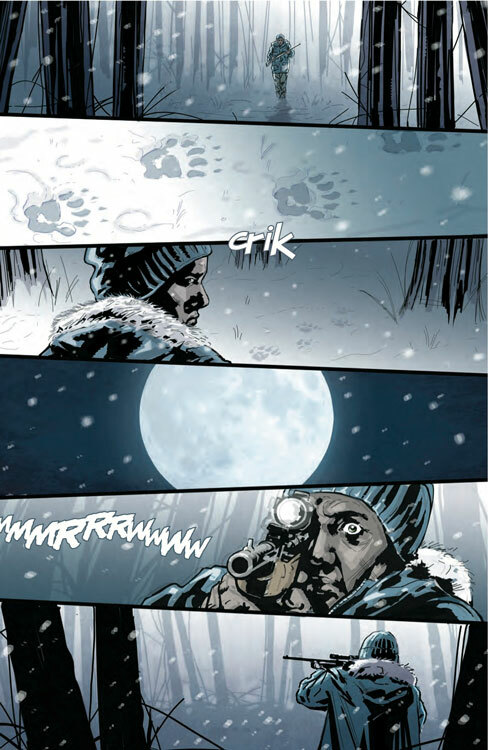 I’m excited that such an excellent werewolf comic is being adapted for film, especially in what sounds like it might be a joint project between horror producer Blumhouse and Boom!. I know he’s probably busy with The Dark Tower, but I’d love to see Laney Griffith played by Idris Elba. Curse is available as a trade paperback on Amazon, Comixology and direct from Boom!. Thanks to @ColonelNemo for the link.